In the month of August the USD had a weak period but it recovered in the weeks of September. The JPY had a low score of 3 in Week 36 but recovered this last week from it. The NZD had no pullback and is the strongest currency in the last weeks. 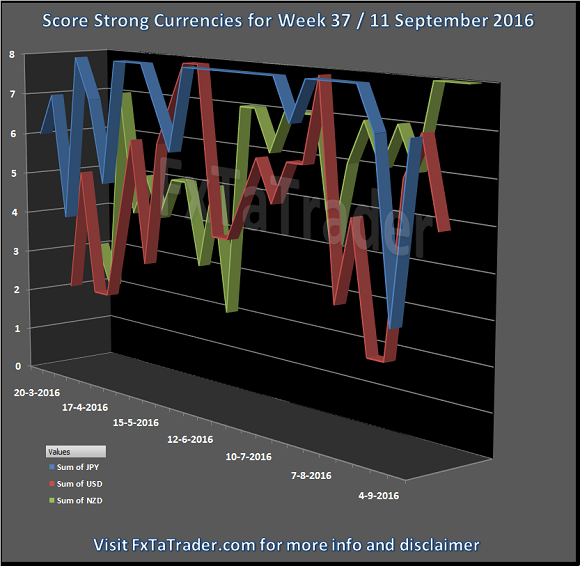 For now the classification made on August 7 remains valid and the strong currencies are back on track. 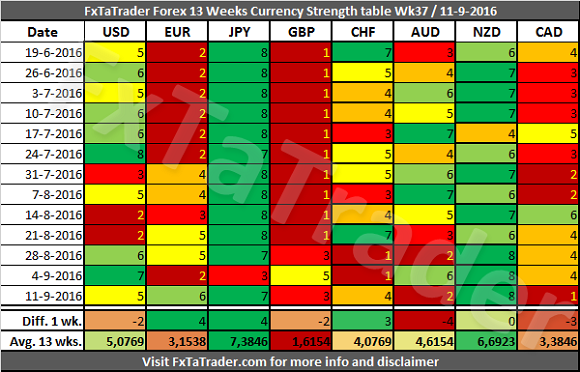 Here below you can see the Weekly Currency Score Chart for the strong currencies with 6 months data as a reference. NZD, JPY and the USD. CAD, AUD, GBP and the CHF. Unless this currency offers a clear opportunity based on the longer term it is avoided. However, this currency may offer opportunities for the short term trader. Some of these pairs comply for a longer term trade based on the Technical Analysis (TA) of the Daily and Weekly chart. We will look at these ones here in a bit more detail. NZD/CAD, GBP/NZD, CAD/JPY, AUD/NZD, NZD/CHF and the EUR/NZD. 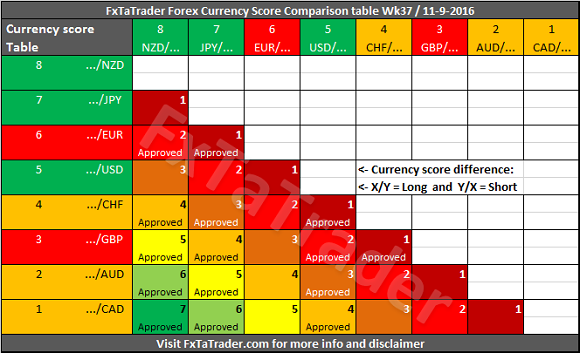 "Currency Comparison Table" all the currencies comply. Technical Analysis (TA) of the Daily and Weekly chart the NZD/CAD, GBP/NZD, CAD/JPY and the AUD/NZD comply.